← Homemade Chocolate Syrup – Without Refined Sugar! Now, I didn’t need to use all of each item for my first batch. I wanted to do a small batch first to make sure it worked before wasting time on a larger batch. I chose Kirk’s Castile Soap because it is made from coconut oil, with no animal by-products or synthetic detergents. You could use other soap like Ivory or Fels Naptha but I didn’t like the ingredient list on those other options. You can use what you prefer. I have heard that Fels Naptha works well. I actually used 2 bars of soap — it was not my intention. You see, I tried to use the food processor for the first bar – rather than grate it by hand on my new Microplane grater. However, the food processor did a LOUSY job and got all gunked up and the texture of the soap was not fine enough and I knew it would not work. I reluctantly got out my new Microplane grater and grated the entire bar (and a bit of my knuckle – ouch!) However, the grater did an awesome job creating nice, small, fine pieces of soap. The soap should resemble shredded coconut (or smaller) when you are done. If the pieces are too big, the will clump in the laundry and not dissolve. 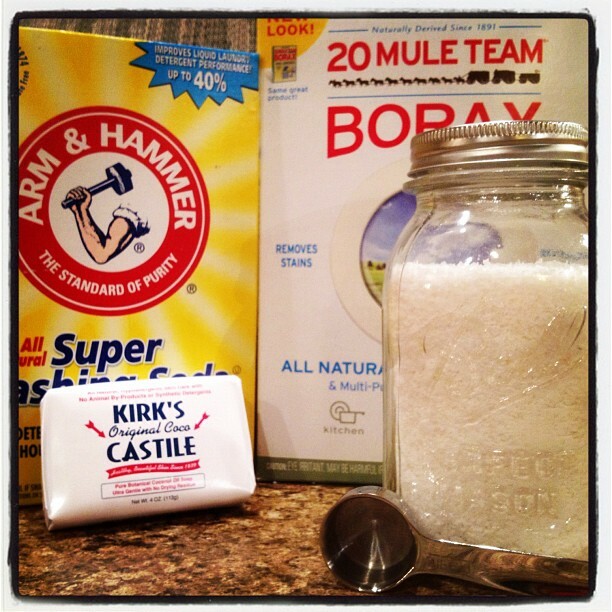 Combine your grated bar of soap with one cup of the washing soda and one cup of the Borax and mix well. All done! See, that was easy! I store my soap in a mason jar and had my husband cut a slit in the lid so I could slip the handle of my measuring spoon (an old coffee scoop) into it so I don’t lose it. I will use the rest of the ingredients and make a larger batch next time, but this small batch has lasted me almost 2 months and I still have probably 1-2 weeks left. However, depending on how much laundry you do, it will effect how long it will last. I am happy to report that I am pleased with my laundry detergent. However — LESS IS MORE. Do not use more than 1 tablespoon per load. I did once, and had to rewash my clothing because it did not dissolve properly. I use slightly under a tablespoon for large load. I combine this with my white vinegar fabric softener and I am superbly happy with the results! One other thing to note – some people add essential oils for a fragrance. I have not. I like the smell of nothingness – just plain clean. This entry was posted in Home Solutions and tagged do-it-yourself, laundry, laundry detergent. Bookmark the permalink. Reblogged this on Mama Miyuki Easy Pantsy. Thanks for this recipe. I have been looking around for both a way to save on laundry detergent and a way to keep from using petrochemicals. I am thinking about making my own liquid castile soap, which is good for about everything else. You are welcome!!! I love saving money while eliminating unnecessary chemicals!